Hurricane Sandy has passed, but many people have lost their homes. Others, more fortunate, are without electricity, heat, hot water, etc. things we all take for granted. Those of us who were fortunate enough to have escaped unscathed, can breathe a sigh of relief and offer a prayer of gratitude to Lord. It behoves us to try to do something to help those hardest hit by the Hurricane. 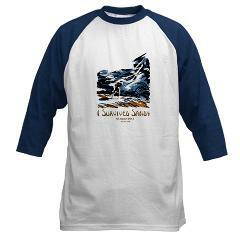 So we have decided to donate all the proceeds from the sale of these Hurricane Sandy shirts to the American Red Cross. Thank the Lord for surviving in the face of great dangers. Fortunate to survive one of the biggest hurricanes to hit the U.S. These shirts are available in a variety of styles and colors. Sizes range from newborn to plus so all members of the family, including the dog, can wear them. Remember all JewTee products come with a 30 day satisfaction guarantee.